Alex is an inspiration to all of us. Despite the fact that he has been battle cancer for the last 3 years, he has dedicated his life to reducing his carbon footprint. He has selflessly voluntarily worked numerous hours in East San Jose as his passion remains to have a clean environment for his neighbors to enjoy. He has focused his attention on recycling glass, plastic and aluminum. He has also composted his backyard and is growing vegetables. He believes in self-sustainability and has worked towards reducing his water usage. 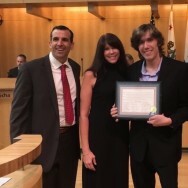 The City of San Jose and Mayor Sam Liccardo commended his effort by giving Alex the SAVE THE PLANT award. This has not been easy because his personal challenges with Osteosarcoma. Alex was diagnosed in March 2012 at just 15 years old. His cancer is terminal. He has had over 22 surgeries on his leg, lungs and mid-section. He suffered through numerous rounds of aggressive chemotherapy, but the cancer continues to return. In November of last year, he was given two weeks to live with a terminal diagnosis; yet he is still here today. Alex desperately wants to live. Yet during his battle, he has inspired a community with his recycling and trash cleanup projects in order to “save the planet”. His mom is a single parent since Alex was one-year-old. She continues to hold a job at a dentist office but rarely gets an opportunity to work because she is taking care of Alex. She feels so blessed that the dentist is so compassionate and has not terminated her. However, mortgage payments and bills are high in the bay area, and Alex constantly worries about how his mom will keep up; both now and when he is gone. Alex hopes that some assistance will help alleviate some of the burden on his mom so they can spend time together chasing rainbows and dreams in the time he has left. Copyright © 2007-2011 Human Connexus Foundation | All rights reserved.